No progress on Illinois budget; Moody’s warns Illinois of further downgrades. 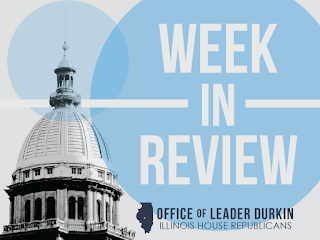 While the Illinois House has held a series of “pro forma” hearings on the budgetary requests and needs of Illinois state agencies, there are no State budget numbers for FY17 or FY18. FY17 is ending on June 30, 2017, without a written budget, and FY18 will start on July 1, 2018. 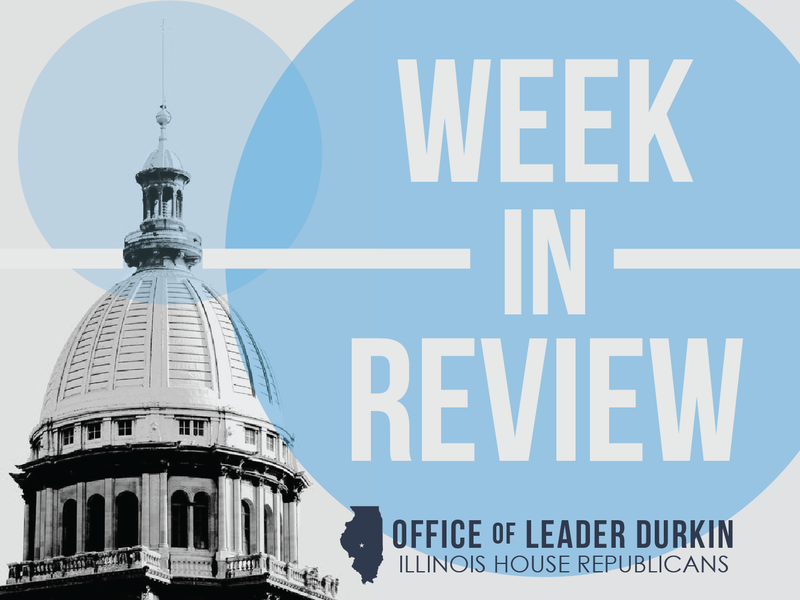 Under State law and the Constitution of Illinois, the General Assembly is mandated to approve a balanced budget that will guide State spending for the approaching fiscal year. The Constitution requires that this budget not commit to spend more money than is expected to come in during the fiscal year. The legislature did not fulfill this mandate for FY17, and is not making progress to do this for FY18. As March 2017 ended, Illinois had more than $12 billion in unpaid bills on file with or under the supervision of the Office of the Comptroller of Illinois. Gov. 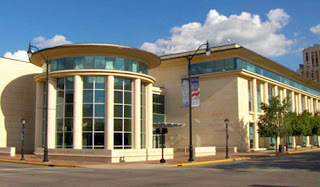 Bruce Rauner is moving ahead with plans to make the Abraham Lincoln Presidential Library and Museum a separate state agency. Rauner will issue an executive order Friday making the ALPLM a standalone facility, an idea first floated three years ago by House Speaker Michael Madigan, D-Chicago. Rauner's order will also place the remaining functions of the Illinois Historic Preservation Agency under the Department of Natural Resources. 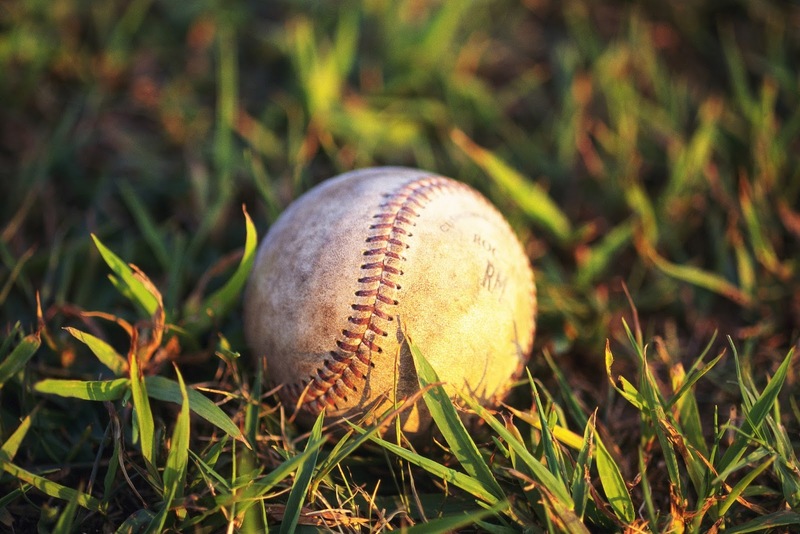 Cardinals Opening Day against the Chicago Cubs is on the horizon, which is something most baseball fans can all look forward to. But there is something else I look forward to happening, and that is for both Democrats and Republicans to work together and approve a balanced state budget. 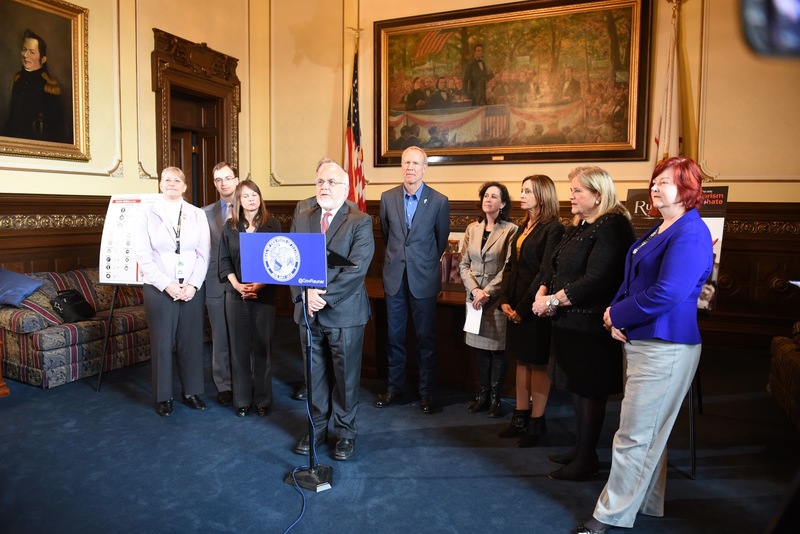 The Illinois General Assembly held its version of Opening Day on January 11, 2017 when all 118 representatives and 59 senators took the oath of office, marking the first day of business for the new legislature following the November election. It was a fresh start, a new year, and a real opportunity to accomplish what many promised to do after the election – pass a balanced budget. Yet here we are today, halfway through the season we call ‘session’ and the legislature has accomplished little to brag about in the record books except more losses and less victories for the taxpayers. Read more by Rep. Charlie Meier. 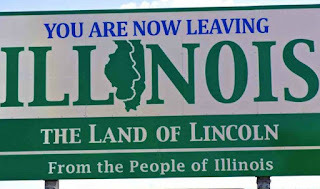 the expansion of anti-hate education in Illinois. Governor Bruce Rauner announced today the State of Illinois will work with the Simon Wiesenthal Center to expand anti-hate education to Illinois students. This is part of Governor Rauner’s efforts to combat anti-Semitism and other hate crimes in Illinois. The Simon Wiesenthal Center today presented Governor Bruce Rauner with its 2017 Digital Terrorism and Hate Report at the State Capitol. He is the first Midwestern governor to be presented with the report. As consumers, when we walk into a store we have many options, not only in the products we choose but in the brands of those products. As taxpayers, we rarely get that option. As a state, Illinois spends 3.7 times the national average on our non-Medicaid clients, but we have one of the largest numbers of low-need individuals in costly nursing homes. Spending more money hasn’t resulted in better services or better quality of life for the people that need them. 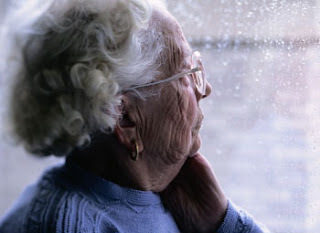 The Illinois Department on Aging has developed a new program that will improve the way Illinois serves seniors not eligible for Medicaid while saving the state money. The Community Reinvestment Program allows the state to maintain funding at 2 times the national average for seniors not eligible for Medicaid while addressing the projected 57 percent increase in our aging population. Read more by Rep. Mark Batinick. State Rep. Tony McCombie, R-Savanna, was honored Monday by a group of veterans on behalf of her late Vietnam-veteran father, as well as thanked for a bill she introduced to help aging veterans and other seniors. The presentation took place as Rep. McCombie was holding "traveling office hours" with residents at Colona City Hall. The local veterans presented her with a T-shirt commemorating the Vietnam Veterans Memorial, as well as a Vietnam service coin. Rep. McCombie's father, John "Jack" Reagan, served two tours of duty in Vietnam, beginning in 1967. He died in 2012. Rep. McCombie was also thanked for her bill, introduced last month, that would raise the income limit for eligibility for the Senior Citizens Assessment Freeze Homestead Exemption, which offers seniors a reduced property-tax bill. Read more. Leader Jim Durkin: "Stop this insanity. For too long, the majority party has shirked their responsibilities – whether its raising the income tax under the guise that it would pay down old bills and put people back to work – or passing reckless unbalanced budgets year after year. Simply raising taxes and increase spending without any reforms didn’t work then - and it won’t work now. We need to actually reduce spending and demand property tax relief and include reforms to grow jobs and our economy." 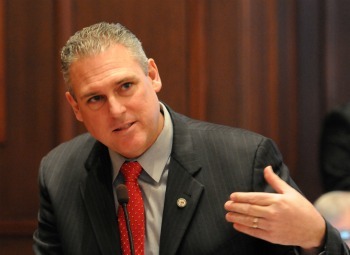 House Republicans offer comprehensive pension reform proposal and CPS relief. House Republican Leader Jim Durkin today called on Speaker Michael Madigan and the House Democrats to join the House Republicans in passing comprehensive pension reform that would provide significant savings for taxpayers and $215 million to the Chicago Public Schools for a one time pension parity payment. library on the SE corner of Madison & Third Streets. 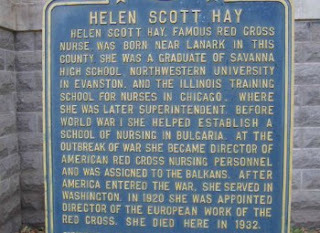 State Representative Tony McCombie honored Helen Scott Hay, a trailblazing nurse from Savanna, in a speech on the floor of the Illinois House of Representatives. After her work with the Red Cross, Helen Scott Hay moved back to her hometown of Savanna where she continued to serve the community in various ways – even as principal of Savanna High School. Before Helen Scott died in 1932 after a full and meaningful life devoted to helping others, she exercised her right to vote. Read more. Computer Banc is teaming up with State Representative Sara Wojcicki Jimenez, other area lawmakers, and state officials and agencies to help improve children’s access to digital literacy tools. The pilot program aims to repurpose surplus government computers to provide children low cost learning tools for education readiness both at school and at home. Rep. Jimenez (R-Leland Grove) said she is excited to work with Computer Banc on its idea to get more computers to schools at a low cost and help children access vital technology. "If Illinois is ever to achieve to its potential, it must effect dramatic change." 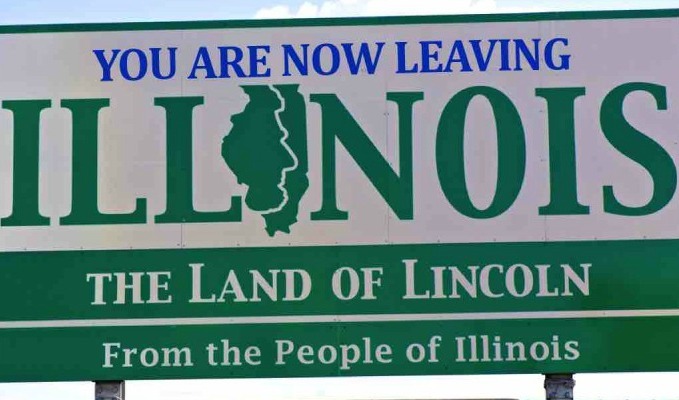 Illinois is badly trailing the leading states in job growth and lower unemployment. A U.S. Department of Labor report last week had modestly good news for much of the country. A handful of states saw a significant drop in their unemployment rates, while 28 states recorded sizable gains in jobs, from January 2016 to January 2017. In fact, 28 states could boast of notable employment gains, ranging from Minnesota's 1.1 percent (32,300 jobs) to Idaho's 4 percent (27,500 jobs). Not mentioned was Illinois. Read more. With one of the highest tax burdens in the nation, property tax relief must be priority. 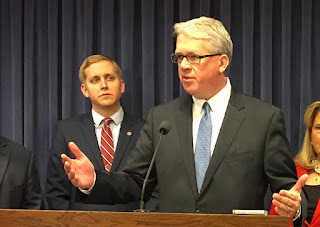 Speaking at a press conference Tuesday at the Capitol, State Rep. Mark Batinick and his House Republican colleagues drew attention to the number one issue for many Illinois homeowners: the need for property tax relief. When State Representative Keith Wheeler heard the cost to translate the Illinois General Assembly's website into one other language could be as high as $1.5 million, he knew he could find a better solution. One that was significantly less expensive and more inclusive. COGFA reduces State revenue forecast by $657 million. Many State tax revenues streams are earmarked for general funds used to fund key budget areas such as education, public safety, and social services. The Commission on Government Forecasting and Accountability, the General Assembly’s nonpartisan budget forecasting arm, reported to the legislature this week on trends in State revenues that will affect the reminder of FY17, ending June 30, 2017, as well as the approaching FY18 (starting July 1, 2017). COGFA uncovered patterns of modest year-over-year gains, or even declines, in many categories of revenue that are closely tied to overall State economic activity. Areas of weak or absent revenue growth included individual income taxes, corporate income taxes, sales taxes, public utility taxes, cigarette taxes, and corporate franchise taxes. 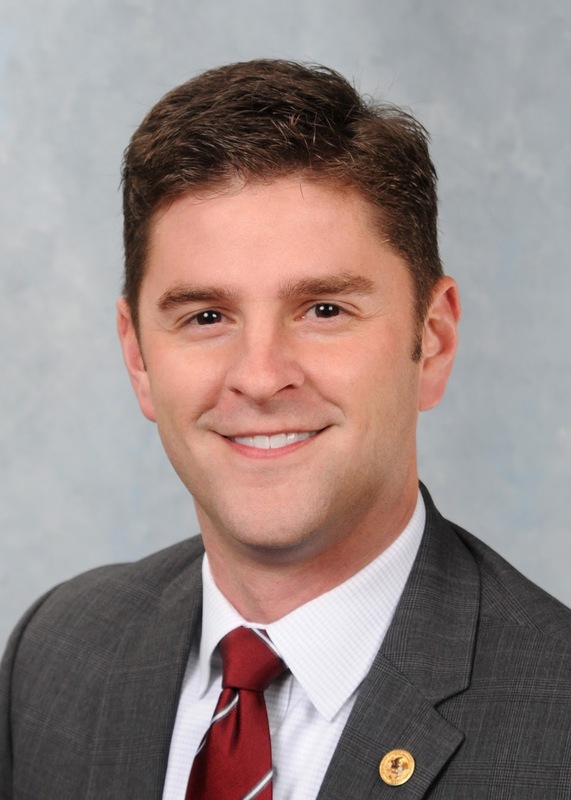 Legislation introduced by state Rep. Tony McCombie, R-Savanna, enabling construction on existing nuclear power plants has passed unanimously out of the House Energy Committee. Since 1987, Illinois law has prohibited the construction of new nuclear plants as well as any necessary improvements on existing plants. Rep. McCombie's district includes Exelon's Quad Cities Generating Station north of Cordova. Read more. 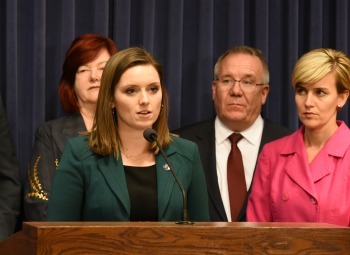 Rep. Avery Bourne said Thursday there is renewed urgency for the House to stop delaying action on her bill to ensure that state employees will be paid even without a budget in place. At a Statehouse news conference, Bourne, R-Raymond, said the Democrat-controlled House should act now that Attorney General Lisa Madigan is asking the Illinois Supreme Court to decide if workers can be paid without an appropriation by the General Assembly. 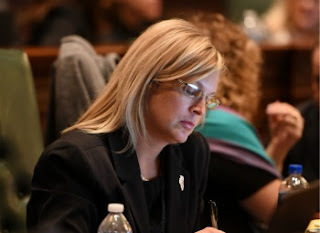 "This bill will ensure state employee pay and make sure state employees and their families are no longer used as political pawns," Bourne said. "We feel our legislation is the best approach to avert a government shutdown, to ensure that vital state operations continue, and to make sure state employees continue to be paid for their work. 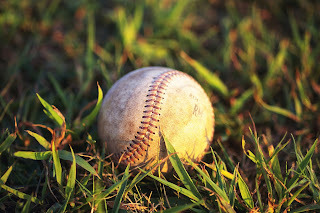 This issue is much too important to stall any longer." Read more. In 1922, just two years after women were given the right to vote, Lottie Holman O'Neill was the first woman elected to the Illinois State legislature. 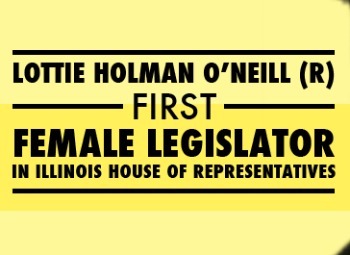 She continued to serve in the Illinois House and Senate for 40 years. Two years later, in 1924, Florence Fifer Bohrer, daughter of Governor Fifer, was the first woman elected to the Illinois Senate. Floy Clements of Cook County became the first African-American woman to be elected to the Illinois House in 1958. Gov. Bruce Rauner makes major Medicaid proposal. The proposal to increase the percentage of Medicaid medical cases that move through “managed care” was unveiled on Monday, February 27. 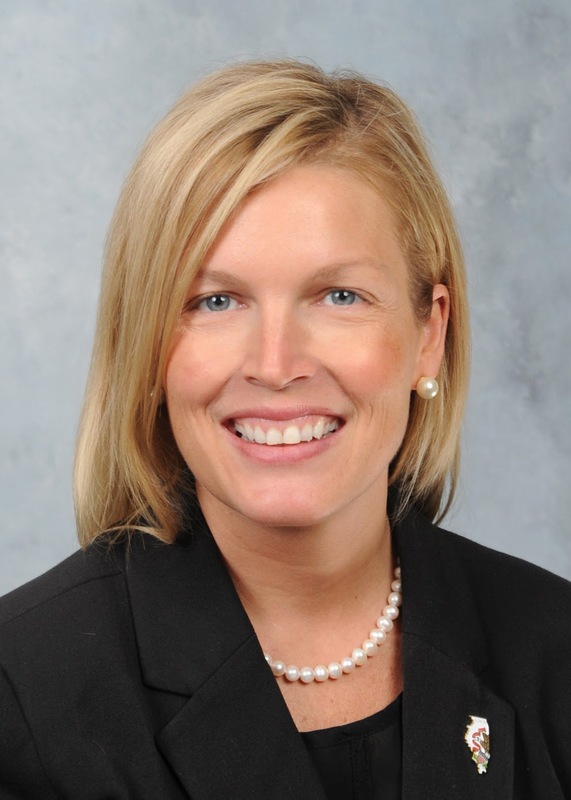 The state’s chief executive called for expanding existing Medicaid managed care programs to cover 80% of Illinois’ three million Medicaid patients. This would mark a major increase in managed care from the current percentage of nearly 67%. In Medicaid managed care, private insurance firms serve as “gatekeepers” for treatments, performing a role similar to insurance firms that manage groups of families that receive employment-based health care.